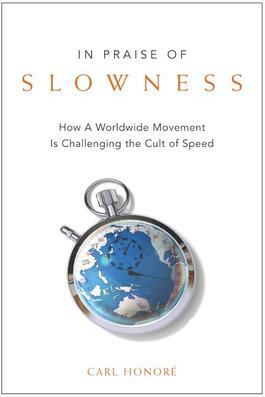 I'm reading In Praise of Slowness by Carl Honore, who writes in that informal, flowing style that I love so well. Then again, I do have a soft spot for Brits....oops, he's a Canadian living in London. Honore recounts everything that is fast and why it is killing us. Having said that, he optimistically reports various examples of how and where a Slow Revolution is taking place around the world. I tend to read too many books simultaneously, which makes it difficult to finish any one of them, at least in a reasonable timeframe......Hell, I haven't even launched my west coast book group team yet. I plan to write quite a bit about the book and my thoughts around 'slow' and what this really means to us as a culture, as a species and more. I get the sense that eventhough you're in technology, you yearn for something a little less high tech, and more high touch.